MASTER PROBLEMS Family and Home Improvement Caring for the aged- Why a growing problem? Caring for the aged- Why a growing problem? 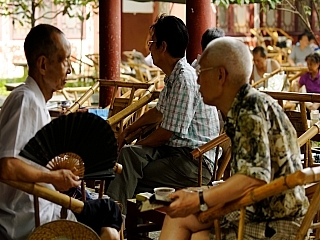 Recently, a new law on visiting parents in China was introduced to make it mandatory to visit parents who are over 60 years old regularly. It carries a jail sentence for those who fail to adhere to the law." There is still much debate on how the law will be enforced, but this clearly demonstrates that caring for aged parents is a growing worldwide problem. In times past like in traditional China, the elderly in Africa were also highly esteemed. They were respected for their experience and knowledge, along with the wisdom and judgment these often bring. Times have changed. Poverty, inflation, unemployment, and mass migration to the cities have left many of the elderly to fend for themselves. For example, Oniyan, who is 68 years old, lives in West Africa. When she was younger, she dreamed of enjoying her twilight years in quiet retirement, surrounded by her children and grandchildren. Instead she spends her days selling cold drinking water under the tropical sun. The little she earns helps her to survive. Her two sons live in another country far away. It has been a long time since they sent her any money. But what is causing the elderly to be neglected? Why caring for elderly is a problem? In the hustle and bustle of this modern world, it is easy for the elderly to get pushed into the backwaters of life. Especially, young ones just entering the race and hurrying to get on with their lives tend to feel that the elderly just get in the way, that they have outlived their usefulness. Maybe we should all stop and reflect: What qualifies a life as useful anyway? It’s easy for the young to devalue the lives of the old and attach an inflated value to their own. Also as the number of the very elderly escalates worldwide, the perplexing question of how to care for them becomes more critical. In earlier times the problem was not as difficult. They had the extended family, where children, parents, and grandparents lived together. Children and grandparents interacted with benefit to one another, and parents could make the necessary material provisions and also see to it that any special care needed by the elderly in the household was made available. Such extended families with care for the elderly are still the rule in some countries today. But that is not the case in the anymore in nations where the family circle is limited to parents and children. When the children grow up and marry and have children of their own, often they are faced with the problem of caring for their aged, frail, and often chronically ill parents. In this present economic recession, to do this can be a weighty problem indeed! As undesirable as it is, under present economic conditions, it may be necessary for both parents to work. Food is expensive, rents are high, bills come in. Even two paychecks can disappear quickly. If the woman of the house does not work outside, she may be busy with children, shopping, cleaning—a full-time job in itself. This is not to say that an elderly parent, or parents, should not be cared for. What it does say is that it can be a very difficult assignment nowadays. Studies reveal that although men may provide financial assistance, it is primarily women who provide the personal hands-on care. They cook meals for the aged—often spoon-feeding them—they bathe and dress them, they change them, they drive them to doctors and hospitals, they see to their medical supplies. The elderly have their aches and pains, and understandably they can at times be complaining and crotchety, not always congenial and of a sunny disposition. None of which means that a strenuous effort should not be made to take care of elderly parent at home. However there are times when elderly may need to stay in a nursing home for their needs to be taken care adequately. Just as the examples above show, caring for aged parents will continue to be a major problem. Do we expect other countries to make it illegal not visit parents just as China has done? Well, only time will tell. However every country and family will have to do it's best not to neglect the needs of elderly.